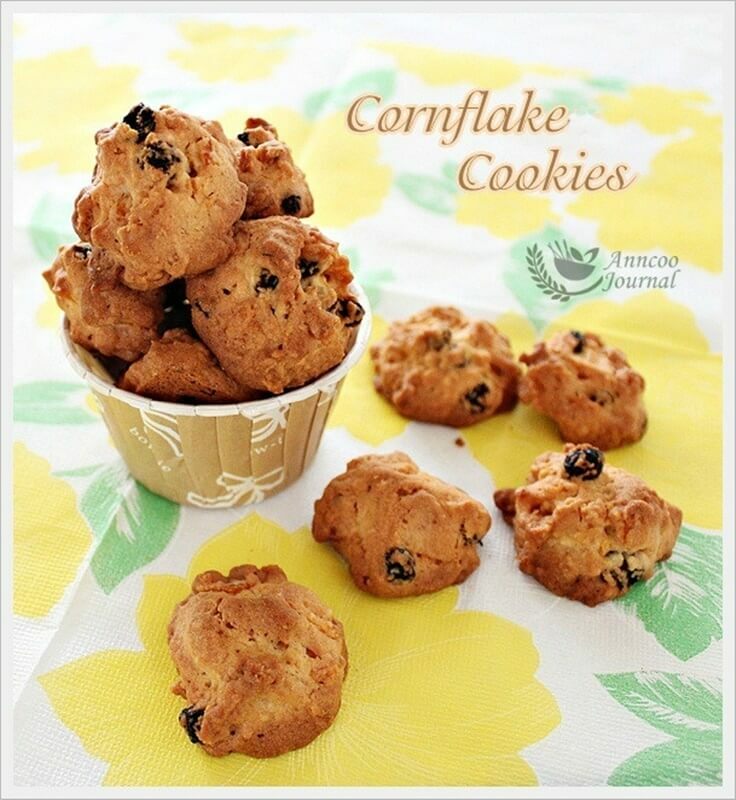 My friends and family love my Cornflake Cookies and it is their all time favourite. I used to make these fragrant and crispy cookies for festive seasons or at someone’s request. So happens that I still have some cornflakes left in my pantry and without second thought, I made these cookies again for ‘Little Thumbs Up’ event. It is a very simple drop cookie recipe that I’m sure you will enjoy very much and they’ll be gone within a day. Sieve and combine plain flour, baking powder and vanilla powder together with the crushed cornflakes and black currant, set aside. Cream butter, egg and icing sugar together till white. Pour in all the plain flour mixture to the butter mixture and mix them together at low speed (do not over beat), then mix well with a spatula. Shape the cookie dough using a dessert spoon then using a butter knife to push the dough down onto the baking sheet. Bake at preheated oven 180 degrees C for about 15 mins. Then cool the cornflakes cookies completely and store into an airtight container. and hosted by Esther (Copycake Kitchen). Hello! I'm Ann Low. Welcome to my humble blog - Anncoo Journal, a place where you can find many quick and easy recipes that I have created that could inspire you to bake or cook at home for your loved ones . Please feel free to browse around. Read more about me... and the photo gallery in the recipe index. Hi Serebe, I’m not sure about storing the dough inside the fridge. Since you said is balance mixture, can have a try. May I know why my cookies is not crunchy n crispy? Hi Sheryl, This is a very simple recipe. You only need to cream the butter, egg and icing sugar for a few minutes, then mixing in the flour mixture only takes a few seconds. Just make sure your cookies are fully baked. The butter/sugar/egg mixture must beat until pale white? Hi Michelle, yes the batter must be beaten until pale white for easier shaping because of cornflakes added. May I know which brand of butter you use? Salted or unsalted butter? Hi WeiTing, I used SCS salted butter. Thanks for your reply. How much cookie can I make with one batch? About 100 pieces in one recipe. Thanks for sharing! I baked this over the weekend and love it. Crispy and buttery! You're welcome 🙂 Great to hear you loved this cookie. tho had been eating so much cookies during last cny, i dont mind at all taking a few of these into my mouth now ! Yes, I do remember having made and eaten cornflake cookies. Seems like such a long time ago. Wish I could have a couple right now with my morning cup of tea. Thanks for sharing this with us at Tea Tattle Thursday. Cornflakes is made of corn. Why didn't I think of that? These cornflakes are great classics! Love to have one now with my tea! I never had cookies with corn flakes and from your description I am sure that I will be addicted to them. I haven't made cornflake cookies for ages – years even. What a nice reminder these photos are. I too enjoy good cornflake cookies! These are divine! 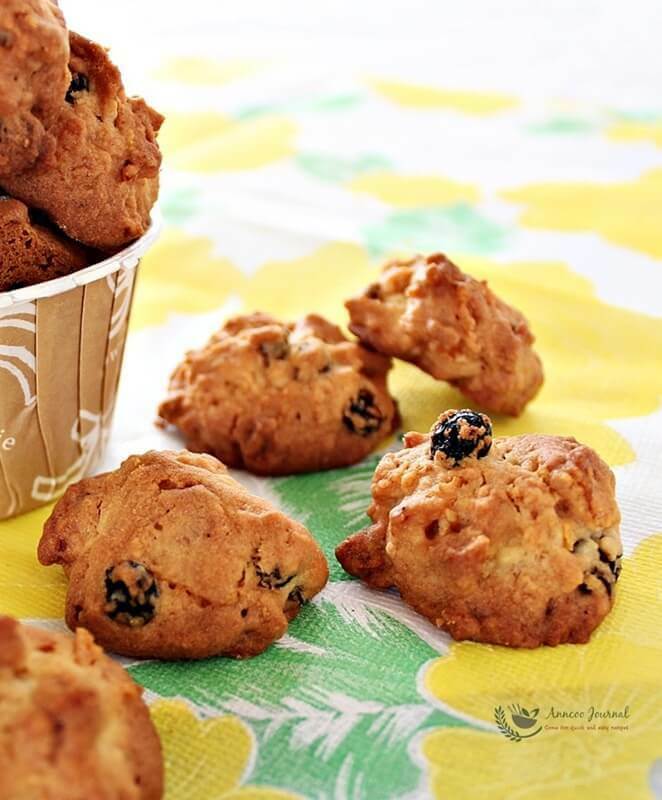 These cornflakes cookies are something I must try…very tempting indeed! This cookie is perfect for all occasion! my family loves cornflake cookies too. yours remind me how I miss this. I can tell that these are very addictive. I don't think they can last long in my house. I have been thinking of these recently too. Looks like you are cooking and baking all my cravings….haha. There was a packet of cornflakes that I have been wanting to make cornflakes cookies but then was too lazy. In the end I used it all up in making a cornflakes banana cake 😀 Now I regret……hmmm. Need to go and buy cornflakes again. Those look very delicious! I will have to try them…I love your pics! Now not only your friends n family love your cornflakes cookies. I also love love love your cornflakes cookies. Thanks for sharing this to LTU. Ann , I was the reading the part where you linked this post to Little Thumbs Up , and told myself , where's the corn in those cookies ? Oh ! Cornflakes ! Stupid me lol Those cornflakes cookies look yummmmmm ! Cornflakes cookie is one of my favorite CNY cookies. My husband keeps asking me to do cookies for him…ok .. Then I mark this down since I also like crunchy cookies instead of chewy type. Hi Ann, yes these are awesome!!!! I baked these during CNY and everybody loved it! Its so simple to do and it yields great cookies! The only thing I have to do is to bake longer to get it all brown so that the cornflakes inside the cookies are crunchy and not chewy. Overall, yes it is G O O D!!! Thanks for reminder; I should have some more cornflakes leftover from CNY. Hee hee baking and eating time again!! Hi Ann, your cornflakes cookies look addictive. Great for my tea break now to go with coffee. 🙂 Nice click. This is also one of the most sought after cookies by my siblings during CNY! Nice clicks! I love these too but my sons won't eat any cookies except pineapple tarts! Makes me itch to make some too….lucky no corn flakes at home lol! delicious cookies, good for my tea break now lol. Oh my all times favourite! Definitely gg to try this out! Thanks! What a delightful – breakfast? – cookie! Oh, me me me, can I "da bao" some with me? Lovely cookies, to go with tea or coffee… Shall make these sometime.